Elkland and Osceola "As We See It"
Probably the last stand of virgin hemlock timber in Tioga County is located on the Tubbs farm, near Osceola. It occupies a few acres just off the Keeneyville road. These denizens have stood in a vertical position for 300 to 500 years. During this time they managed to get their tops about 130 feet from the ground. One giant is 3 feet through and is estimated to contain 2612 board feet. However, old age has at last got the upper hand and their capacity to grow is down to a whisper. It has taken 38 years to put on the last inch of wood. This grove was a predilection of the late Hon. Charles Tubbs, of Osceola. It was he who executed it from his own lumbering operations. Through use it became known as "Charles Tubbs’ Picnic Woods". Here in his prized timber he enjoyed the great outdoors with his friends. Those who like to fish enjoyed hooking into native trout in Windfall Brook which meanders through to the Cowanesque River less than a mile away. Five hundred years old! This means some of these hemlocks were about 42 years old when Columbus discovered America. Years later regiments of militia trained here for the Civil War. In 1807 a man named Asahel Nobles chopped one acre of this heavy timber for the Tubbs family for a barrel of salt; in those days salt cost $5.00 a barrel. That was some chopping party. With feet that make no sound upon the floors." Nestled I the hills in the northern part of Tioga County is one of the county’s oldest landmarks, a 141-year-old building called the "Block House". The cabin, of hand hewed timber is on a 600-acre lot and is owned by Warren Tubbs of Buffalo. It has been in the Tubbs family since 1880. The cabin was built by Paul Gleason in 1835. Chester Cady hewed the logs and James Tubbs hauled them. John Cilley dug the cellar and Joel Jewitt and William Dunham did the carpenter work. The building was repaired in 1894 and reshingled in 1881 by Henry Baldwin. It was first owned by John Gleason from 1835 to 1841, J. B. Redfield from 1841 to 1845, H. B. Cilley from 1845 to 1850, L. P. Hoyt from 1850 to 1858, James Tubbs from 1858 to 1880 and Charles Tubbs in 1880. it has been in the family ever since, Warren being the son of Charles. The house was used as a tenant house for the people who worked the land. Realizing the value of the property, Charles Tubbs decided to use it as a summer home and as a place for the collection of antiques. Charles Wells has been the caretaker for the Tubbs family since 1907. The heirs live in Buffalo and spend weekends during the summer season here. They are Mrs. Warren Tubbs, Mrs. James Hanrahan, Warren Tubbs and Elliott Tubbs. Paul Gleason from 1837 to 1839, J. W. Gleason from 1839 to 1841, J. B. Redfield from 1841 to 1845, Franklin Starr, 1844 to 1845, H. B. Cilley from 1845 to 1850, L. P. Hoyt from 1850 to 1857, Charles Clark from 1857 to 1858, George A. Clark from 1857 to 1861, Sanford Clark from 1858 to 1861, Charles Hathaway from 1863 to 1868, David Teachman from 1868 to 1868, F. G. Gleason from 1869 to 1872, A. G. Teachman from 1872 to 1878, Henry Kizer 1878 to 1887. A huge fireplace occupies part of the right side of the cabin. On the mantel is an old fashioned candlemaker and candle holders on each side. On the right of the fireplace is a Dutch oven and at the left is an old fashioned toast maker. Iron kettles of all sorts adorn the fireplace. In front of it is a cobbler’s bench which the modern housewife could use as a coffee table in her living room. There are four spinning wheels, one of which is for cotton and one for linen. A cherry drop leaf table and a rocking chair are in the living room. The clock is an old wooden spool clock. In the bedroom are a four poster bed, an old phonograph and a heavy wood work table with a shelf underneath. Wooden handmade hangers are on the walls, in keeping with the rustic effect. A long cherry dining table and chairs are in the center of the room. Guns of all types, some used in the Civil War, rest against the sides of the building. "With feet that make no sound upon the floors." The following statement was found with some old papers relating to the construction of the Parkhurst Memorial Presbyterian Church in 1889. There is no date established for the statement, but it can be assumed to have been written shortly thereafter. To decipher the writing was very difficult, and there are a few blanks and some possible errors. In this bicentennial era I feel that the ensuing statement will be a small contribution to this history of Elkland. He has lived nearly opposite the old burying ground situate south of the main road and west of Presbyterian Church lot in Elkland Borough between nineteen and twenty years, during which time he knew of but one interment therein, that being the wife of Judge John Ryon, whose body was brought from Lawrenceville, Pa., but about 1885 was removed from said burying ground with the other remains belonging to the Ryon family and which was all enclosed inside a small plot with a picket fence surrounding it. During this period he thinks no fence was kept up around said burying ground except he did it or Mr. Joel Parkhurst caused it to be done at their own expense, ________________ it ________________ when citizens repaired it sufficiently to keep their cattle and calves there when it afforded good pasture. There has been no fence of any kind on south side of burying ground for many years. It has been treated so far as it could be, without interfering with any graves, as a part of the Ryon farm. ___________ is the grass cut up to the graves on the south side when hay was cut on land adjoining. No one has been interested enough to cut the few weeds which overrun the lot, and it was always a hard looking lot, with a hedgerow of wild plums between it and the Church, and one low spreading apple tree which grew just east of the Ryon lot fence, growing so low there a child could not walk under it and _________________ fruit and other shrubs making an impassable hedge in which woodchucks and skunks had holes. This apple tree, with the wild cherry tree was white each spring with the nests of worms; added to this _______________ headstones were not flat in the ground, some leaning and ___________________. This was the condition of the lot up to June 1st, 1889 when the big flood came which ______________ all stones standing, breaking a number and leaving upon the lot flood trash of all description: stumps, rails, barbed wire fence, lumber, saw logs, lath wood and refuse so that the lot was covered, and in some places four feet deep. No one gave it any attention, and on Tuesday, July 9, 1889 when Parkhurst heirs began to excavate for our Church. They had to clean the rubbish off at their own expense. After ______________ hauling away wagon loads of trash, Mr. Geo. S. Walker their surveyor carefully made a diagram showing the exact location of every grave, with the name of each occupant, as near as could be ascertained by the location of the head stones, which were mostly down and in nearly all shapes, with reference to the graves, covered with mud, and some broken and ______________- the water and logs had gotten the stones mixed up, so that they could not be put in their original position with any certainty, but by scraping off the tan bark and sawdust every grave could be seen by its badly sunken condition, and a diagram was carefully made; so that the grave of every person can be located, except, perhaps, two and if the friends of those two can remember what graves were next or nearest to them, then they can be located with certainty. The current of water was very strong in this locality during the flood. It broke down C. L. Pattison’s iron fence front of his residence for several rods, and carried off flagstones out of his stone walk in his yard which would weigh from 400 to 500 lbs. The water carrying some of them several rods and it was just as difficult to tell the exact spot each flagstone came from as it would be to replace each headstone. Notice was intended to be given to Elkland Journal week ending July 6/89, but no Journal was issued so their friends could if _________________ look at condition of ground and decide about reentering bodies, but as no violation of the graves was thought necessary, work was begun after the old Church was removed off July 9/89 on their end of the excavation, and the following bodies, which were under the site of the proposed Church, were taken up completely, nothing being left but _________________ and ______________ and boxed and reburied in another place in the same lot and nearest on diagram except Mr. Sarah E. Smithford was removed by H. L. _________________ to his lot in Woodhull and Mary E. Whitaker, infant daughter of Dr. Whitaker, 4 months old was, at request of her mother, removed to her lot in new cemetery. The following named infants were not disturbed: John A. Miles, aged 12 years, and Harriet A. Miles, aged one year; John W. Richards, aged 5 months; Emma C. Page, aged 2 years and Wm. Henry McLean, aged three years, all being near the east side of the lot as shown on plot. J. P. McCorkin’s son, 5 weeks old was moved to S. W. corner of lot. The stones were all gathered up and pile up in shed, and ground cleaned off to see graves, and locate them, and then the earth from ____________ was scraped o the rest of the burying ground and so covering the graves up quite deep _______________ when wall is up to grave yard ___________ and slope it up to wall. In Elkland Journal this week a notice was put, saying the C. L. P. or B. H. P. would do whatever the friends desired with the remains. Mrs. Lester Dorrance came on Saturday, July 13/89 and was looking for the headstone of Clark Bottom, her brother, but none could be found and there could not have been any. On Friday Mr. Elliott came here on my urging him to do so, and I showed him the lots and explained the situation to him, and he thought it was all right, said he ___________ after he gets _______________ examining it there and he did so 7/13/89 and says it is O.K. if we do as he and I agreed when he was here; grade off yard and put small flat markers at head of each grave, and remove those under Church to other burying ground and marked graves. In 1889-90 during the building of the present Presbyterian Church in Elkland many grave sites had to be moved, as the west wing of the present Church occupies what originally was part of the "burying ground". Some remains were moved to the new cemetery, and some were relocated on the west side of the Church. The original headstones, having been damaged by the June flood of 1889 were incorporated in the air shafts below the cellar of the Church, where they still remain. Small flat markers were purchased and installed on the twenty-two graves, and during the years until 1955 these stones had gradually sunk into the ground until they were almost invisible. The following is copied from the Session Minutes the Parkhurst Memorial Presbyterian Church in 1955: "In the fall of 1955 a map was discovered in the vault of the Pattison National Bank and given to G. K. Smith, which showed in exact detail the location of buried markers for the original cemetery in Elkland. G. K. Smith and T. O. Pattison, using the map measurements, located all of the markers, and decided to make the Churchyard a permanent memorial by resetting the stones. The work was done by Goerge and Albert Hall, by putting a twenty-four inch foundation under each stone. The cost of the work is being defrayed by subscription of interested Church members and is underwritten by the trustees. G. K. Smith has made a copy of the above map, as the original one was in very poor condition." Names on present markers in Churchyard: Hannah Landon, aged 85 years; Elihu Hill, aged 69 years; Charlott Christian, aged 21 years; Sarah M. Stevens, aged 29 years; Augusta Jane S. Blake, aged 7 years; Clarinda Shoff, aged 31 years; Amasa Daily, aged 27 years; Betsey Benedict, aged 60 years; Charles C. Benedict, aged 2 years and Evander R. Benedict, aged 6 months, one stone; Joseph Buck, aged 63 years; Lenora Wood, aged 6 months; Laurett Culver, aged 2 years; Rasett Culver, aged 9 months; Henriett Culver, aged 2 months; Marion Culver, aged 5 months; Dorothy Bottom, aged 3 years; Amasa Culver, aged 66 years; Hannah Culver, aged 58 years; Clark W. Bottom, aged 15 years; Hannah Benedict, aged 19 years. Back in the year 1840, a class of church-minded people in the town of Osceola, Pa., was organized through whose efforts in the years to come, would result in the birth of the First Methodist Church of Elkland, Pa. These people were a part of the Osceola Methodist Church which originated as an outgrowth of camp meetings during the 1820’s, held in cabins, barns, school houses and in the open air when the weather permitted. The first of these camp meetings was held in September of 1828 on the banks of the Cowanesque River on the then George Buckley farm (just west of Osceola now owned by Perry Elliott). Large number of people assembled themselves from far and near into huge camp meetings where they spent days and nights in preaching and prayer, intermingled with shouts and songs. To summon the meeting, a dinner horn was sounded which echoed far and wide through the forests. The Rev. Parker Buell did most of the preaching; Rev. Joseph Pearsall, famed for his vocal powers, led in the singing. Around the camp a watch was set at night, to see that peace and quiet were maintained. Those disorderly persons were impounded in the "lock-up" located under the pulpit. This "guardhouse" beneath the sacred desk was instituted as a terror to the evil doers. One year later the second meeting was held at the same place. The meeting began on Wednesday and continued until Monday of the next week. Large crowds were in attendance with Elder Abel in command of the camp. The preaching was with such force and effectiveness that the listening multitude were wrought-up into an ecstasy of religious fervor. The third held six years later in 1835, was conducted by Rev. Nathan Fellows. Although the attendance was large, the interest was not to compare with that manifested in the previous camp meetings. It was at one of these meetings that a skunk was thrown into the camp grounds causing that meeting to be adjourned for the night. On another night a tree was felled upon the worshippers as they were bowed in prayer. It was also at one of these meetings that Rev. McElhany stood guard at the entrance while the congregation conducted the "love feast" within and refused admission to any who wore the "gaudy attire" of artificial flowers, or bows of ribbon upon their bonnets. Early Osceola was somewhat larger than the village of Elkland, however as Elkland grew, its people felt the need of a church of their own. While the gospel had been preached in the valley before by itinerant ministers and lay preachers of local repute, belonging to both Methodist and Baptist denominations, it was the Congregational Church who was the first to be organized under the leadership of Rev. Seth Porter, who came to the Valley to practice medicine. It soon became known that he was also a minister of the gospel. He preached the first sermon in the old schoolhouse which is now the home of Lee Redfield. At a meeting of the inhabitants of the Township of Elkland and its vicinity, being convinced of public notice given three successive Sabbaths previous, for the purpose of forming a religious society – After much prayer it was resolved, it is expedient to form a religious Society in this Town and by these presents and our signatures, we do form ourselves into a Society to be denominated, The First Congregational Society of Elkland Township. Further resolved that John Ryon, Thomas Rathbun, Martin Stevens, Elihu Hill and Marinus W. Stull be the Trustees of our Society, who during the term of their service are authorized to do all such matters and things appertaining to said Society as the Laws of the Commonwealth of Penna. empowers them to do. Further resolved that a Secretary, a Treasurer and three or more Trustees shall be chosen annually and that the Society shall hold its annual meeting for the above and sundry other purposes in the place designated within the Town by the Trustees on the first Monday in January at 1 O’clock p.m. in each year. Resolved that Joel Parkhurst be the Secretary and that Lemuel Davenport be the Treasurer of said Society. Resolved that every person paying for the support of the Gospel in said Society or invests money in the public property of the same, shall while they do or hold the same, be voters in every meeting of said Society. Resolved that the above resolutions be recorded on the Book of Records of the Township of Elkland, Tioga County, Pa. Dated the 23rd day of April, 1877, and recorded in Tioga County Deed Book number 58 at page 209 &c.
and recorded in Deed Book number 94, page 5, the 9th day of September, 1891. Edwin W. Coates was the janitor in this church of several years. His pay was $15.00 per year and he furnished his own kerosene. This building was used until 1891, at which time it was moved to the rear of the lot and the building of the present edifice commenced. The same bell used in the old Union Church to call the worshippers together is still in use today and is heard each Sunday morning at 11:00 o’clock. Several of the pews in the old church were at the time sold to the church at Potter Brook and are still in use there. Jeff Mack, who helped to build the new church, later built the house on Second Street now owned and occupied by the Charles Kreisler family. The railing and spindles around the stairs I the Kreisler home were taken from around the chancel in the old church. Rev. J. O. Jarman was pastor when the new church was being built. He helped to draw stone for the foundation and although he worked hard to see the work completed, he never preached a sermon in the new auditorium but was transferred to another charge, just five days after the dedication. The present church edifice was dedicated on September 25th, 1891 and had been built at a cost of $5,800.00. This figure included the cost of moving the old church to the rear. The head carpenter in charge was Thomas Brock who was assisted by Jeff Mack, William Preston and Daniel Webster. 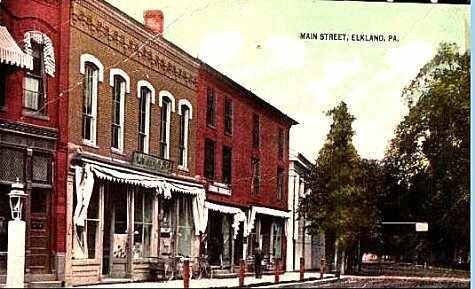 The cost of building was met by popular subscriptions among the citizens of Elkland. One of the largest contributors was Joseph Cornelius, who was the owner of the tannery at that time. The Cornelius family was not only instrumental in the building of the church but was also very active in all church work. The pulpit set complete was purchased in 1894 by the eleven children of Mr. and Mrs. Joseph Cornelius as a memorial to them. The windows were all donated by various parties. Joseph, William and Frank Cornelius each donated a large front window. The Knoxville and Westfield Methodist Churches each gave a window. Memorial Windows were given by Dr. Wright to Edna Alice Brock, also by B. H. Parkhurst, F. M. Cornelius and J. J. VanHorne to Dorcas. Other memorial windows were for Rev. W. A. Allen, E. B. Campbell, B. B. Dorrance, Mrs. Clara Bailey Howland, Rev. Charles Weeks and Charles E. Peters, the last being a young missionary who was buried in the Congo River, Africa, enroute to his first missionary assignment. The Three chandeliers were purchased new for burning oil. Nearly every Sunday evening, the sexton would have to bring in the step ladder to take down one or more of the twenty-four oil lamps, as they would continually smoke Mr. William Martindell reports that on one occasion, the sexton angered by one smoking lamp, flung it through an open window which was near by. In 1902 when natural gas was first piped into Elkland, the chandeliers were converted from oil to gas, which was a big improvement. When electricity came to town in 1939, they were wired and used in the main auditorium until replaced in 1946 by new lantern type fixtures. The old organ which is now in use in the Methodist Church at Osceola, was purchased new for $1,000.00 in 1895. William Cornelius was at that time choir director and bass singer and his wife Josie was the organist. Both were very fine musicians. At that time the choir had as its members Abbie Weeks, Verna Kenyon Cornelius, Frank Cornelius and wife, Myra, Byron Cornelius and wife Lou, Ruth H. Bailey and Cora Webster. In the year 1897 there were 125 members in the church and sixty pupils in the Sunday School with Will Cornelius as its Superintendent. The first pastor in the new church was Rev. I. K. Libby who was here for five years, which was as long as conference would allow a pastor to remain in one charge. Rev. John Segwalt was pastor in 1896 and was followed by Rev. William Henderson. The latter was six feet, six inches in height with large broad shoulders. The lectern was a little low for him so William Martindell built an eight inch addition which added that much to its height. Rev. John Humphrey, a short stout Englishman succeeded Rev. Henderson. and sealed by Thomas A. Fessler, Notary Public. On March 21, 1916 a contract was made by the church Trustees with Miss Virginia Wood to purchase the old parsonage for $1,500.00. Until this date Elkland and Osceola had always had the same pastor with the parsonage at Osceola. During the history of our church, the Ladies Aid have been a very important society. In the year 1944 Genesee conference changed the name to Woman’s Society of Christian Service. The business meetings are held the first Friday in each month and include devotions and missionary study. This society has charge of the social life of the church as well as raising of money to be used wherever needed. At the present time the membership is forty-two. In 1943 the inside walls of the auditorium were refinished with celotex by Rev. E. T. Rowe. He announced that the church would never go broke as he had nailed a new dollar bill to the highest point on the west side of the building under the celotex. In 1944 the Baptismal Fountain was given by Dr. and Mrs. D. G. Grover as a memorial to Joanne. One year later the new organ was purchased with 457 pipes at a cost of $4,500.00. Chimes were given as a memorial to John L. and Ettie Louise Sheen by their sons J. Lewis and Donald H. Sheen. One large chandelier was given by Mr. and Mrs. Roy Bailey as a memorial to Clark and Ruth J. Bailey and the other chandelier as a memorial to Frank and Almina Dailey by Mrs. Myrtle D. Brass. A small chandelier over the choir loft, side lights, wilton carpets, velvet drapes and choir robes were donated by personal subscriptions and organizations within the church. "To the Trustees of the Methodist Episcopal Church of building committee of the Methodist meeting house of Elkland. I will build the house at or near the size and at or near the same plan of the meeting house at Beecher’s Island as you may direct and to have it done by the first or middle of May 1851 and do the House in a good workmen like manner for eight hundred and fifty dollars and subscribe $50.00 for the same. That is if the building committee be responsible for the pay as called for on the subscription. I have had it in mind for some time to contribute a chapter on the early annals of this church. So little has been known about it away from its immediate locality that an intelligent writer in the Wellsboro Agitator in November last, stated that as late as 1844 Rev. J. F. Calkins of that place, had a parish that extended north to the Cowanesque valley. I think if it did, there was an overlapping of the parishes of Presbyterian ministers. I have found many difficulties in the way of collecting information. In the first place it is admitted that the earliest records of this church are lost. In the second place such records as do exist are defective – full of omissions. In the third place I discover among those elderly people of whom I have made inquiry a great lack of recollection or an indisposition to tell what they know, as if it were a disagreeable subject. To one outside the membership, this apparent attitude of mind of Christian toward the church organization to which he belongs, is hard to understand. I state now such facts as have come to hand in the hope that their imperfections may call out many additional items not herein set down. The gospel had been preached in this Valley even before 1800 by itinerants and by lay preachers of local repute – Methodists and Baptists – but aside from the Quakers at Knoxville, I do not find that an organization had been formed by any ecclesiastical society previous to this one at Elkland. If there had been I can find no record of it. Probably some Methodist classes had been formed, lists of whose members have since been lost. Elkland originally was large in territory. In talking of the early annals of the church I must call your attention to the town as it was in the time of which I write. When the town was erected in 1814 it extended along the state line 11 miles, from the 93d mile stone to the 104th, beginning three miles west of the village of Lawrenceville and extending to two miles east of the village of Knoxville. The town was ten miles deep and included what is now Elkland, Osceola, Nelson, Farmington and parts of Deerfield, Middlebury and Lawrence. Of its original 100 square miles of territory but one or two remain under the name, it having been shown of its ancient domain by successive acts of the legislature and action of the courts. I find that this early church had members in all of this territory except perhaps Middlebury, as well as in Knoxville, Deerfield, Brookfield, and in Woodhull and Tuscarora, N.Y. The families who first settled in this valley were mainly from the New England states. The Bulkleys, Bottums, Bacons, Blanchards, Coates, Culvers, Clarks, Cooks, Dorrances, Hills, Hammonds, Hoyts, Ryons, Seelys and Tubbs’ were from Connecticut; the Gleasons, Knoxes and Barkers from Massachusetts; the Wrights and Parkhursts from New Hampshire; the Crandalls from Rhode Island. These had passed their early days under the iron rule of the New England hierarchy whose form of church government was mainly Congregational. At Beecher’s Island there were several Scotch-Irish families – the Campbells, Hazletts, Ellisons, Meginleys. These had been reared in the strict Calvinistic faith that prevailed in the North of Ireland, whose form of church government was Presbyterian. In faith there was no essential difference. These families came one by one, or in small detachments, and at different times. They had severed such church connections as they might have had at places of former residence. They brought no pastor with them. From such heterogeneous and scattered material, after much delay, was this church gathered. Of the inner and spiritual life of this church I shall not attempt to write; only of some of the outward manifestations of its life and activities shall I attempt to tell. Seth John Porter came to Elkland in 1830 to practice medicine. He was a young man, twenty-eight years of age, tall, slender in figure, with brown hair, a fair complexion and in rather delicate health. He was well dressed and well mounted; social in his manner and of pleasing address. As he mingled with the people in the practice of his profession he rapidly made friends. It soon became known that he was also a minister of the gospel, that he was of the Presbyterian denomination, that he was a graduate of the Auburn Theological Seminary, that he had already been a pastor five years at Jamesville and Manlius, N.Y. From time to time he began to preach near his home in school house No. 3, where James Brocklesby now resides. His occasional sermons were scholarly, thoughtful, earnest. His delivery was quiet – in marked contrast with the elocution of the itinerant who had hitherto exhorted our grandfathers at camp meeting. To many of the men and women of New England birth and training his teachings brought back a longing to return to the faith of their fathers. Sometime in the year 1832 they gathered about him, and he organized them into a Congregational church. The members of this church were: Elihu Hill and Henrietta his wife; William Barker and Anna his wife; Hubbard Clark and Eunice his wife; Elisha B. Benedict and Hannah M. his wife; Anna Bacon, Clara Tubbs, Jane Christian, Almira Christian, Lydia Mack, Margaret Blend, Jane Blend, Polly Johnson, Nancy Rathbone, Hannah Hammond and Sylvina Bacon – nineteen members. Elihu Hill was chosen and ordained a deacon of this church at the time of its organization. Mr. Porter went on his way practicing medicine and ministering to this small church at infrequent intervals until September, 1833, when he sold out his interests in Elkland and removed to Kalamazoo, Mich., where he soon after died. So far as I can learn Mr. Porter received no compensation for his ministerial labors in Elkland. Of the original members, Mrs. Anna Barker was the last to depart this life; in February, 1892, aged eighty-five years. On the 16th of August, 1834 the Second Congregational church of Elkland was organized by the Rev. David Slie. Of the life and labors of this minister I have gathered no facts. The nucleus of this church was Hubbard Clark and Eunice his wife, who took a letter of dismission from the above church. The other members who joined on profession of their faith were: James Campbell and Mary his wife, Samuel Snow, Nahum Kelly, Sabra Daily, Dolly Bottum, Sarah Bottum, Hannah Culver, Jane Ellison, William Clark and Caroline Clark, Milla Cummings, Eliza Phelps – fifteen members, Samuel Snow was chosen and ordained a deacon. This church was gathered at and about the Beecher’s Island. On the 26th of September, 1834, the First and Second Congregational churches of Elkland met at the Ryon school house and united into one church to be called the First Congregational church of Elkland, and adopted a Confession of Faith and form of Covenant. This made a united church of thirty-two members. At this union the rev. Octavius Fitch officiated. Of Mr. Fitch I have the most pleasant and agreeable account. He had a genial, sunny, winning manner. His tone was moderate; he was never boisterous; he was strong as an evangelist. He often preached in Deacon Hill’s barn and on the second floor of James Campbell’s house at the mouth of Thornbottom Creek. In the 10th of the following October the church had an accession of eleven members. As these are so near the foundation you will pardon me for naming them, viz: Joseph Campbell and Ann his wife, Hannah Snow, Abigail Snow, Harriet Boyer, John Hazlett, Enoch Blackwell, Patty Johnson, Content Bottum, Betsy O’Brien, Elizabeth Tubbs. December 31, of the same year, there was another accession of members in the persons of Nancy Bosard, Maria Bosard, Charles Lugg and Richard Ellison, when the church met at the house of Deacon Hill, situated where U. A. Bosworth now resides in Osceola, for the purpose of receiving them. If there have been no deaths, there are now forty-seven members. The time is ripe for a Presbyterian church to appear. Accordingly on the 23d of January, 1835, at the house of Amasa Culver – on the farm where Mrs. Philip tubs resides – after prayer and "considerable consideration", the First Congregational church of Elkland unanimously resolved to adopt the Presbyterian form of Government Query. "Rev. Elijah Day Wells, born in N.Y. City Sept. 29, 1800; died Feb. 11, 1883. He was ordained to the Gospel ministry by the Presbytery of N.J., in 1823. His first charge was at N. Rochelle, N.Y. In 1831 he organized the first Presbyterian church in Tioga County, Pa., and was installed its pastor at the dedicatory services of the present house of worship, which he labored most zealously to secure and where he preached Christ and Him crucified with untiring devotion until he fell asleep under the light of the Saviour’s countenance with joy unspeakable and full of glory." Rev. Oren Johnson was the pastor for the next two years, 1837 and 1838 and perhaps part of 1839. While here he was a bachelor and boarded most of the time in the families of Deacon Hoyt and Deacon Hill. He was an educated man and had received the Master’s degree. He was a devoted and conscientious Christian. He was very strict with himself and with others. The following anecdote is related to him: While boarding with Deacon Hill he cultivated the garden. To guard against trespassing hens he was in the habit of catching them in snares and releasing them after they had fluttered awhile. One Saturday night he forgot to take up his snares. Sunday morning Aunty Hill asked him what she should do in case a hen got caught during the day, in one of his snares? "Let her hand," replied the minister sternly. It is not surprising to learn that he continued the work of disciplining the members of the church for offenses of more or less gravity and that some suffered excommunication. The important work of erecting a permanent house of worship in the place of the old tabernacle was accomplished during the first year of Mr. Johnson’s pastorate. Of this I may write more fully in a subsequent chapter. During this pastorate five members were received into the communion of the church by letter, two on profession of their faith and ten children were baptized on the faith of their parents. Among those received were Joel Jewel and Mary, his wife, from Hector, N.Y. In 1840-41 he also ministered unto the church about one year, during which time there was an accession of three members by letter and of two on profession of their faith. This was his last pastorate. Mr. Johnson subsequently went to Michigan, married, and engaged in farming. "In memory of Rev. Octavius Fitch, a faithful and earnest minister of Jesus Christ. Died Feb. 24, 1869, aged 67 years. For me to live is Christ and to die is gain. Phil. 1:21. This stone is erected by Mrs. Emily Olmstead of Geneseo, N.Y., as a token of her esteem." Rev. Darius Williams came in 1841 after the last year of Mr. Johnson’s service and remained one year. He was a man of fine presence and preached able sermons. His pastorate was marked by no distinguished event. Rev. Lewis R. Lockwood was Mr. Williams’ successor in 1842. He remained two years at this time and was here again from 1852 to 1855. Mr. Lockwood was a man of medium stature, had black hair and eyes, and a dark and swarthy complexion. He possessed great argumentative power and eloquence, and in the pulpit had an impressive and fiery delivery. He had a large repertoire of anecdotes and personal experiences which he liberally drew upon for the entertainment of his auditors in private conversation. I am told that up to this time he was the only Presbyterian minister ever known to smile or laugh. He was an enigma. His prayers were fervent, sincere, prevailing, and mightily laid hold of the throne of grace. Certain foibles of conduct were of a contradictory character. He was an inveterate user of tobacco and had not adopted, it was said, the total abstinence phase of the temperance reform then just coming into vogue. He once had a hearing before the session of the church for some alleged misconduct on charges involving the purity of his relations with some members of his congregation. He was acquitted. This was during his first pastorate. After an interval of eight years he preached again at Elkland with great acceptance for three years. Another important event happened during Mr. Lockwood’s first pastorate. The Presbytery of Chemung in February 1844, directed the organization of a new church at Beecher’s Island within the bounds of the Elkland church. The people at Beecher’s Island were an important part of the church and felt sufficiently strong to go alone. I infer that this action was distasteful to that part of the church that was not going out into the new organization and the Presbytery came in for its share of criticism. It had, however, taken its action and stood by it. The Elkland church therefore withdrew its allegiance from the Presbytery of Chemung (N.S.) and transferred itself to the Presbytery of Susquehanna (O.S.) in which it remained until the union of the two schools in 1870. There is always some pain accompanying the process of birth. Joel Jewel and Mary his wife, Joseph Campbell and Ann his wife, James Campbell and Mary his wife, John Hazlett and Mahala his wife, Charles Lugg and Mary Ann his wife, Charles Blanchard and Livina his wife, Harris Ryon, Samuel Hazlett, Edward Mapes, Sarah Campbell, Sally Campbell, Mary Ann Campbell, Oliver Blanchard, Robert Casbeer and Susan his wife and Enoch Blackwell. Total, twenty-two. The swarming time had come. In the swarm were several king bees – members of the session. Joseph Campbell was ordained an elder, January 23, 1835; James Campbell October 3, 1835. Joel Jewell in 1840. John Hazlett was ordained a deacon October 3, 1835. Joel Jewel had been clerk of the session from November 23, 1842 to October 23, 1843 at which time it is noted that he "had been licensed t preach by the Presbytery of Chemung at its last session." Mr. Jewel and others lived in Farmington several miles out on the road towards Wellsboro. On February 7, 1844 another small swarm had gone out in the persons of Josiah H. Foster and Mary Ann his wife, and Mrs. Purdence Foster, "to the church about to be organized at East Farmington." All this in the year 1844 – the year Mr. Calkins came to Wellsboro. It finds the church at Elkland twelve years old and strong enough to found other churches. Some idea of the strength of the parent church before these swarms left the home hive, may be gathered from the fact that fifty-five were reported in communion September 1, 1843. I am certain that the utmost affection has ever existed between the mother church and these interesting daughters. The gathering of the church; something of its founders and pastors; a slight sketch of its life and growth for a dozen years! Perhaps that is sufficient. If I could speak for the church, a little part of whose story I have related, I would send a greeting warm and hearty, to that daughter who rounds out a half century of organic life on the 2nd proximo. Judge John Ryon permitted the Meeting House to be built on his land. At the same time he set apart a lot adjoining the Meeting House on the west for a neighborhood burying ground. The pioneers of the Cowanesque Valley who built this place of worship came from the New England States and their ancestors from Old England, where for many generations it had been the custom to bury the dead in and about the church. In doing so in their new homes in this valley, they were following the immemorial custom of their ancestors. Thus when in the fullness of time the men and the women who organized the church society, were gathered to their fathers, their remains were reverently laid away in the burying place in the shadow of the old Meeting House. Before and after service and at intermission it was the habit of worshippers at this sanctuary to stroll among the graves. The first Ruling Elder of the session is buried there; the first chorister of the choir is buried there; the young wife of the first superintendent of the Sunday School is buried there, as well as the heads of many of the families of the first settlers who reclaimed this valley from a wilderness. When Judge John Ryon came to his death bed, although at that time a resident of Lawrenceville, he requested to be taken to Elkland for burial, in his old church yard, where his father had been buried before him. And so it was done, according to his request. Thus from year to year for a generation there gathered about the Old Meeting House the forms of those who took their places I the silent city of the dead. This burial plot was not divided into lots but wherever there was vacant ground anyone was at liberty to bury his dead, in the democratic, unregulated, pioneer fashion. Some of the graves were marked with uninscribed field stones, some had not markers, while others were carefully designated with inscribed tomb stones. In September 1899 a woman who was born in the Shingle house on the River road in Deerfield, came with her husband, and became a guest at the hotel in Osceola. In early youth she was taken with her father’s family to a western state and none of her relatives were left behind. On her return she was a mother, and a grandmother. During the intervening years she had cherished the sentiment that when she and her husband retired from the active duties of life, she would visit the place of her birth, and the graves of her relatives in the Cowanesque valley. She had a shadowy memory of clinging to her mother’s skirts, filled with a childish awe, as she stood among the other members of the family, about the open grave of Deacon Hill, as his body was lowered to its last resting place. He was a pillar of the early church – in fact the nucleus about which this particular denomination gathered its members. As a matter of course, he was buried in the church yard. Her father had with a final regard erected a tombstone at the Deacon’s grave and at the grave of his wife, and other relatives who had died while resident here. Accordingly she took an early opportunity to visit the old Elkland burying ground where her relatives were interred. What was her surprise to find part of it occupied by a section of a new church, some of the graves entirely digged up, the dirt removed from the excavation made for the foundations of the new edifice piled upon the remaining graves, and all the tomb stones erected by the hands of loving relatives overthrown and removed. "The low green tent whose curtain never outward swings" had been obliterated into an even grade. Here was a situation hard to understand. Apparently a church society had done this – a church that is taught care and concern for a place of burial in the story of the purchase of the cave of Machpelah, through all the pages of the Book of books, down to the story of the Holy Scripture. What an added charm would attach to the walls of the beautiful edifice recently erected if the rude monuments of the founders of the organization, had been left standing, to connect the progressive present with the rugged simplicity of the historic past. Nevertheless the condition of the Old Church Yard was such, as it was found to be, by our visitor from the West. I can remember four places of worship that have stood where the Presbyterian Church is located. The first was a rough board structure hastily built for temporary use and called the "Tabernacle". It was torn down and in its place was built the "Meeting House". In those days there were no churches. "Priest" Johnson, Revs. Fitch, Williams and Lockwood came there to preach, but none of them lived in Elkland. They were austere men. In January 1911 upon petition of forty-six (46) members of the Presbyterian Church of Elkland and Osceola, a separate church organization was granted by the Presbytery. As a result of this conference, on February 14, 1911, a congregational meeting of the Elkland church made a call to the Rev. John McCahan White for a full time pastorate at an annual salary of $800.00 and the Manse. Rev. J. M. White resigned the pastorate of the Osceola church to accept this call. The organization of the Parkhurst Memorial Presbyterian Church was perfected on February 20, 1911 with one hundred seventeen (117) members joining as charter members. In 1921 Rev. Max C. Putney became stated supply of the Elkland and Nelson Presbyterian churches which relationship continued until 1938 when the area churches were regrouped by Presbytery with the Elkland and Osceola churches again becoming one pastorate after twenty-seven (27) years of separation. This change sent Rev. Franklin Tomlinson to Nelson, Farmington and Lawrenceville churches while Rev. Walter E. Ruch, the incumbent pastor at Osceola assumed the Elkland pulpit, also. In 1935 the Elkland Presbyterian Church celebrated its 100th anniversary with special services and memorials. In 1950 the Elkland and Osceola churches again became separate charges with Rev. Harry W. Gayley, the pastor, going to Osceola and leaving the pulpit at the Elkland church vacant at this time with Dr. Elmer Stuart of Corning, N.Y., filling the pulpit pro-tem. The Elkland Gospel Mission, with some other nearby associated Mission, was established about the year 1900. It has been active on evangelistic and missionary lines. The Mission at Elkland is small at present, but it maintains its pastor, the Reverend John Price, and a missionary in Kenya Colony, East Africa. After the completion of Bible School Training at the Missionary Institute of The Christian and Missionary Alliance of Nyack, New York, in 1929, and coming to this section for a visit, Mr. Russell learned of many in Elkland who were unreached by the Gospel. He decided that there was much missionary work to be done in Elkland, and immediately set to work organizing a Sunday School. 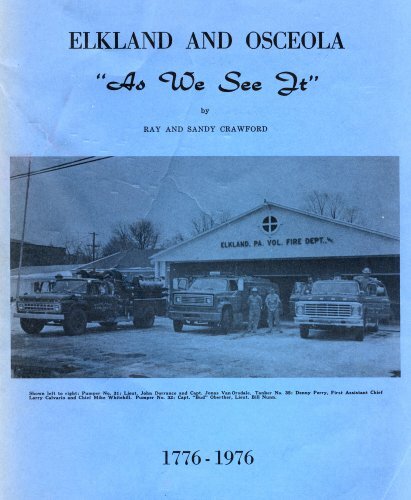 Early in 1931 Mr. Russell secured employment with the Elkland Leather Company. Through contacting G. K. Smith they secured the then abandoned Jacob’s School House where for over two years the Sunday School and church work was carried on. Then came the notice to vacate because the building was up for bids. From there in a private home occupied by Mr. Jesse Van Gorden, Sr. and his family, until desiring a suitable location, finally contracted the corner lot of Coates Avenue and Coates Street in 1934. This property was immediately improved upon sufficiently to move into for the carrying on of the work. It has since been called The Good News Mission; thus named because the Gospel is Good News. The steady increase of attendance and the demand for this type of work to continue has called for an extensive building effort in the immediate future. The Parish of Saint Thomas the Apostle was founded in 1907 by the Most Reverend Michael J. Hobin, Bishop of Scranton. Previously, the Catholic Church at Elkland was served by the Catholic Church at Wellsboro in the capacity or status of "a mission church"; that is, there was no resident pastor. The first Pastor was Father M. F. Manley. Since then, there have been 17 pastors. The present Pastor is Father Thomas J. McDermott, assigned to the Parish of St. Thomas in September, 1974. Pastors for the past quarter century, in reverse order were: Father Joseph W. Bucolo; Father Clement Markowski; Father Thomas J. Croghan; Father John J. O’Brien; Father Joseph Azzarelli; Father Gerald E.Conahan; Father John T. Kerrigan; and Father Edward P. Nolan. It was Father Edward Nolan, presently Pastor of St. Jude’s Parish, Mountain Top, Pa., who secured the present church edifice in 1949. I say "secured" because the building was a former Army Chapel. Such chapels, after the end of the World War, were made available through the Washington, D.C. office of the Chief of Chaplains. Father Nolan was himself a former Service Chaplain. Ground was broken on April 1, and the cornerstone was laid on July 24, 1949. Extensive renovations were completed during the Pastorate of Father John J. O’Brien (1962-66). The exterior was fashioned in the Colonial type. The steeple, the carillons of which presently peal out the "Angelus" Call to Prayer three times daily, was added at that time; the façade was veneered in natural stone. The interior renovations, which adapted the Sanctuary for the renewal in the Sacred Liturgy decreed by the Second Vatican Council at Rome, resulted in a new Altar of Sacrifice – facing the congregation – as well as new lecterns and sanctuary furnishings. These additions were completed during the pastorates of Fathers Croghan and Markowski (1967-70; 1970-73). The Parish of St. Thomas, which includes the Mission Church, St. Catherine’s, Wesfield, presently numbers 590 souls – 155 men; 200 women and 235 children. The Celebration of the Holy Eucharistic Banquet and Sacrifice of the Mass takes place daily; but the Celebration of this Liturgy on the Lord’s Day, Sunday, is performed on Saturday evenings at 6:15 p.m. and on Sunday proper at 7:30 a.m. and 11:00 a.m. Holy Mass at the Chapel of St. Catherine, Westfield, is at 9:15 a.m. every Sunday.